Excerpts: FL@33 is a multilingual, multiple-media design studio founded by Agathe Jacquillat, originally from Paris, and Tomi Vollauschek, who is Austrian. 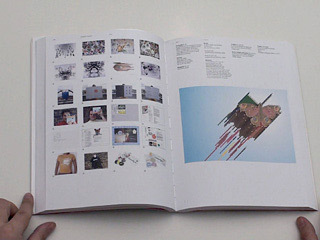 They met at London’s Royal College of Art, and set up in 2001, opening Stereohype, their ‘graphics boutique’, in 2004. Aiming to balance commissioned and self-initiated projects, while also creating publications, FL@33’s work philosophy is based on a ‘Power of Three’ theory: the combination of intellect, skill and emotion. ___ As far as their corporate identity goes, the duo has adopted a flexible approach and earned worldwide recognition from both peers and the public, by way of their self-initiated projects. ‘We’ve never actually printed letterheads as we send out all correspondence as PDFs by email, and we use postcards as business cards,’ explains Tomi. ___ Self-initiated projects range from an online sound collection (bzzzpeek.com), to the award-winning magazine Trans-form, and three books, including Postcard (2008) and Made & Sold (2009) for Laurence King Publishing. The second book features ‘product sidelines’ by graphic designers, illustrators and artists, tapping into FL@33’s network of contributors and colleagues, while also showcasing their own offerings. ___ Keeping that in mind, it makes perfect sense not to construct a rigid identity system, but to keep developing their various logos and images. ___ Under the label Stereohype, the duo designs and produces a clothing range, books and magazines, prints, posters and badges, which they distribute to a global audience. They created a standalone brand (rather than simply trading under their studio name) so as to invite in ‘people whose work we admire or consider inspirational,’ whether well known or up-and-coming. Under the banner of ‘B.I.O. (by invitation only)’, they run a button badge initiative, alongside an annual button badge design competition, which is open to all. FL@33 contributes artworks to the B.I.O. series, alongside designers such as Vaughan Oliver, Genevieve Gauckler and Vault49. 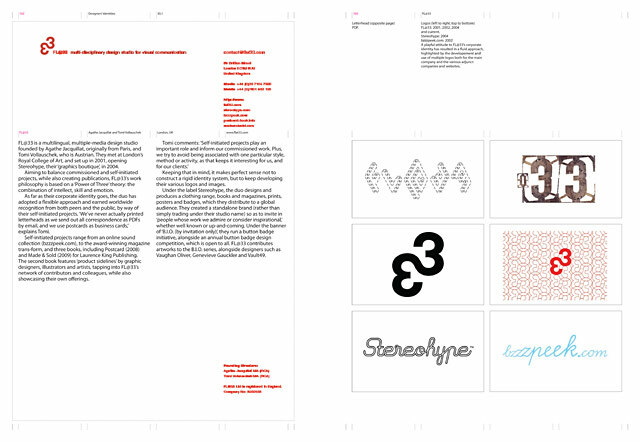 p.103 | Logos (left to right, top to bottom). FL@33: 2001, 2002, 2004 and current. Stereohype: 2004. bzzzpeek.com: 2002. A playful attitude to FL@33’s corporate identity has resulted in a fluid approach, highlighted by the developement and use of multiple logos both for the main company and the various adjunct companies and websites. p.104 | Postcards (1–4): All postcard sets are produced in limited editions and printed on matte uncoated 100% recycled stock. 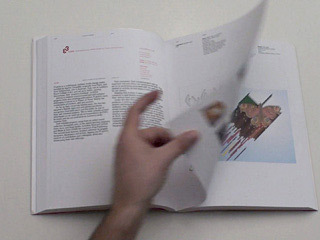 Stereohype orders are sent with a free postcard, while others are distributed at trade shows and exhibitions. Posters: Deer (5), 2003, Hibernation (6), 2003, Eye Sculpture (7), 2002, Spring #1 (8), 2003. Magazine: (9–12): Trans-form, 2002. 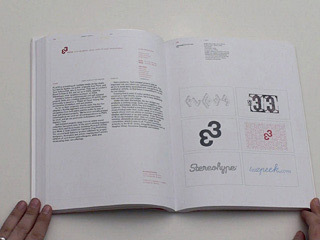 Books: FL@33: design and designer (13 and 14), Pyramyd Editions, 2003. Postcard (15), Laurence King Publishing, 2008. Made & Sold (16), Laurence King Publishing, 2009. Websites: flat33.com (17 and 18), bzzzpeek.com (19), stereohype.com (20), postcard-book.info (15), madeandsold.com (16). Various activities are grouped around a number of micro-sites that may be accessed from the main website. 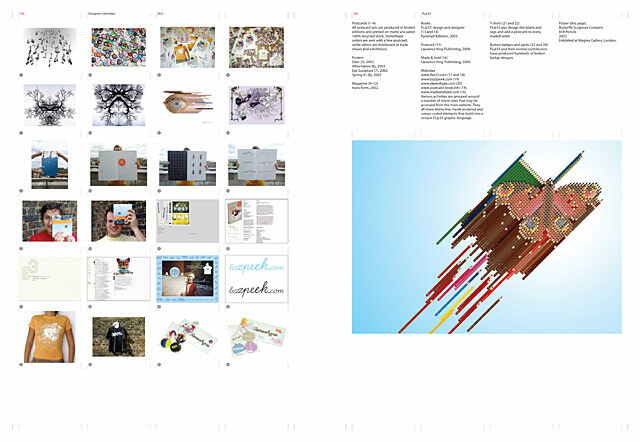 They all share distinctive, hand-rendered and colour-coded elements that build into a unique FL@33 graphic language. T-shirts: (21 and 22) FL@33 also design the labels and tags and add a postcard to every mailed order. Button badges and packs: (23 and 24) FL@33 and their invited contributors have produced hundreds of button badge designs. p.105 | Poster (this page), Butterfly Sculpture Contains 818 Pencils, 2002, Exhibited at Magma Gallery, London. For graphic designers no project is more personal or more crucial, both in terms of commercial success and peer-group positioning, than their own corporate identity. From the first hello, to delivering the invoice, designers are judged, again and again, on the quality of their printed and virtual presentation, including their company name, logo, business card, letterhead, website, blog, newsletter, delivery packaging, brochures, promos, even the typeface they choose. 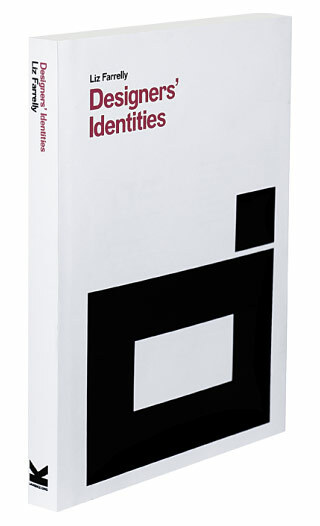 ___ This book examines the corporate identities of 76 designers, at various stages in their careers and from around the world, providing blueprints for best practice and inspiration. Along with detailed information about formats, materials and methods, the book includes a number of interviews with designers, who talk through their own corporate identity programme and the reactions they have had to this, their most personal design project. January 22nd, 2016 — A nice little type treatment in form of a glitch animation of our FL@33 logo for our new customised 404 Page Not Found error page.